Now that the interesting announcements for the first half of 2016 are well behind us, it's only natural that the rumor mill will start churning out leaks and speculation about the next big things to come — the Galaxy Note 6 and iPhone 7. And Apple fans in particular have enough to go on to already be excited about what Tim Cook will show on the stage at Cupertino this upcoming September — for one, wild rumors about a dual camera module present on the iPhone 7 Plus just can't be put to sleep it seems, and secondly, we are expecting a new design. 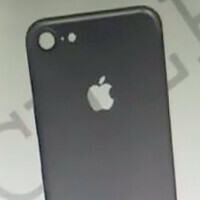 Of course, the latter is not based on any concrete info, but on educated speculation – each time Apple issues a new generation of the iPhone (not an "s" variant), it introduces a new design — the iPhone 4 introduced the metallic rectangle, sandwiched between two glass panels; the iPhone 5 elongated the design to accommodate a larger display, and removed the glass back; the iPhone 6 came with rounded-off corners, thinner profile, and the "beloved" protruding camera. However, most leaks of supposed iPhone 7 designs we have seen so far show us that the new handset may end up looking a lot like its 2 year-old predecessor. So does this latest one — an alleged schematic, showing us the shape and dimensions of the back of the iPhone 7 has popped up. As we can see, we still have the protruding camera on the top left, this time surrounded by a bevel, formed by the phone's metallic body, instead of a protruding ring. Next to it, we have, of course, room for the dual tone LED flash. And, checking the measurements on the schematic, we get the exact dimensions of the iPhone 6's back – 138 mm tall and 67 mm wide. Of course, this still doesn't tell us how thin the device would be. So, how plausible is this? Obviously, there's no room for the rumored dual camera in there, but we've already heard reports that the two sensor-equipped snapper would only be available on the alleged iPhone 7 Plus (or iPhone 7 Pro). And, the leaks for said iPhone 7 Pro do look to share the same design language as this schematic right here, with the same "hill" formation surrounding the protruding camera. 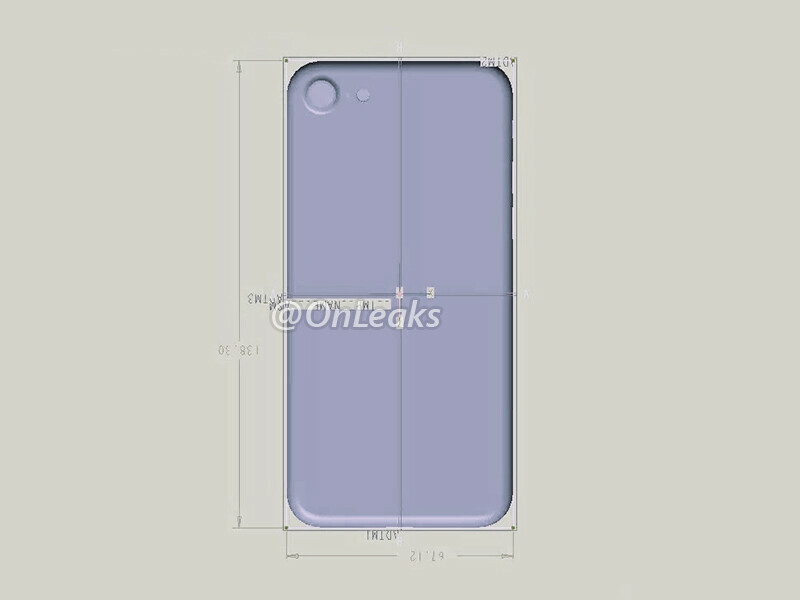 To top it off, we've actually seen this design leaked before – an alleged photo of the iPhone 7 back case that popped up a couple of months ago looks very much like this newly leaked schematic. Still, keep that salt shaker nearby, we are still treading dark rumor territory. Ugh. No more fugly 6/6S inspired design please :( 4/4S and 5/5S design is lightyears better than the 6crap. Just increase the chamfers, or round its edges just a bit, not this full rounded mess. Gosh I really miss Steve Jobs, Apple has made a lot of horrible design choices since he died, just look at the new Apple mouse's charging port location. iPhone 7 may have a hump on the back of it. Please no dual camera. Just build on top of a proper single camera, add more battery life, wireless charging if you want (no biggie) and improve ios 10 a hell of a lot. If it is true, then apple would be approaching the dead end!! Least thing i expect to see is the increase of screen to body ratio, not in decimals tho!! We both know you wouldn't buy an IPhone if they paid you too. Why lie for no reason? BTW everyone, and I mean everyone expected this. If you expected something different, you are incredibly uninformed. ;) Thats one damn truth!! The sketch doesn't look like a new design. It's just an iPhone 6 with the antenna line moved to the bottom and a larger camera cutout. Basically another model with little to no R&D spending. After using the same basic design 4 times, how hard is it to come up with something a bit more newer? Ive is lazy and the device is goign to continue to drop in sales. The design is stale. To use it for a 5th and 6th time with the 7 & possibly the 7S is lame. Good Luck Apple. For this the sales deserve to drop even lower and I hope they do. Run yoru own stupid butts out the market. The sooner the better. if you wanna be slow and lazy like Nokia, RIM and Microsoft; then you deserve to be where they all are now. At the very bottom hanging by a thread. *a bit newer. The "more" is already implied. I do agree that if this is the iPhone 7 it's going to harm Apple, a company that bases much of its ethos around design should not be stale. I'm glad, if it is the 7 design, that they've lined the camera up with the corner radius again at least, that's bugged me since they messed it up in the 6. TechieXP, MS is the 2nd most valued company in the world...followed by Google. only their mobile endeavors are suffering. hahah nice try though. Great post! I agree with every single word of it. Of course it looks the same. What else would we expect from Apple(if this is, indeed, true). Nothing new to see here. Move along... Move along. Hope it'll have bigger camera sensor. The camera is looking.... Eww. Of course it looks the same... it's still a brick. And if they change it everybody looses their minds.. "It's awful!!" So, nobody understands people o get what they want. What all you guys want? Best can't made better.